Customer review platforms have become increasingly important in recent years. Learn how recommendations have changed over time and how customer reviews have come to be a powerful marketing tool. Why are customer review platforms so important? How can I import reviews from other websites? 1. Why are customer review platforms so important? The average person is bombarded with up to 5,000 advertising messages per day. For consumers, this makes it difficult to form an opinion about a given product or service and make the right purchase, especially when all the alternatives promise to deliver the same results. This is why many people are turning to online customer reviews to find information about the quality, level of service, cost-performance ratio, and other details about a host of products and services. If other customers think it's good, then it probably is. Consumers are using the opinions, ratings, feedback, and reviews posted online by impartial customers to make informed purchase decisions. But customer review platforms don't just exist to help customers find out if a product or service is up to their standards. They also allow companies and service providers to leverage customer reviews to generate trust and gain insight into the quality of what they do and how satisfied their customers are. Qualitative feedback from customers sheds light on the strengths and weakness of a business and reveals opportunities to optimise, increase customer satisfaction, and bring in new business. And for service providers, customer reviews are marketing gold: they contribute to your online reputation and generate a sense of trust and authenticity among potential customers. Thanks to the Internet, our society and the ways in which we communicate have undergone massive changes over the course of the last 20 years. While product recommendations used to be limited in the past to simple word of mouth marketing among friends and acquaintances, reviews and impartial promotions are published online to customer review platforms for all to find and read today. Studies have shown than 88% of consumers today trust online reviews just as much as personal recommendations. Around 89% even seek second opinions on recommendations provided by friends and acquaintances by checking ratings and reviews on customer review websites. Online customer review platforms are now seen by most consumers as a source of trusted information when it comes to products and services. Ciao.de was among the first platforms in Germany to offer customer recommendations, personal experience reports, and ratings on products and services. The company doesn’t exist anymore but other platforms have followed in their footsteps. Once a niche industry, it has taken on completely new dimensions, and the number of customer review websites and platforms is increasing all the time. Reviews were originally limited to products, but have branched out to include ratings of doctors, teachers, financial service providers, hair stylists, coaches, estate agents, restaurants, hotels, and more. Customer review websites now make customer feedback on just about any product or service available to online consumers. Most of these platforms specialize in products or services for specific industries or e-commerce, whereas websites such as ProvenExpert provide aggregated reviews and ratings from different platforms to make it easier for consumers to compare vendors and service providers based on the experience of other customers. Today's surplus of customer review platforms can make it tough for both consumers and businesses to keep track of all the reviews and ratings out there. For businesses, it's important to be able to know where and when incoming reviews are posted by customers, patients, clients, etc. in order to be able to respond to them. But it requires a lot of time and energy to browse every review website looking for new reviews. So how can you streamline this process? An effective solution is to aggregate all your online ratings and reviews across all platforms. ProvenExpert lets you import your reviews from other customer review platforms into a single profile. This feature makes it easy to keep track of all incoming feedback - no matter where it's posted — with a convenient, central overview. ProvenExpert also aggregates your rating scores from other platforms and factors them into the overall score displayed in your profile. So there's no need to pick and choose which reviews to pay attention to — with ProvenExpert, you can have it all. Originally, customer feedback and recommendations were limited to products. Customer review platforms then gradually began adding support for reviews of service providers as well. Today, there are a number of industry-specific customer review platforms where consumers can provide and find feedback on nearly any service imaginable — hair stylists, physiotherapists, doctors, real estate agents, solicitors — before making a final purchase decision. Since it's difficult for consumers to judge the quality of a service before actually using it, customer recommendations and reviews have become enormously important in making an informed purchase. If a service provider doesn't have a large customer base yet or hasn't collected many reviews, negative feedback can pose a considerable threat to their company's reputation. This is why it's so important to actively collect reviews and ratings and encourage satisfied customers to share their experiences and thus help shape the company's online reputation and public image. Unfortunately, it's typically the more dissatisfied customers who voice their opinions by posting negative feedback and reviews on customer review platforms. So it's vital to actively get your satisfied customers to join the mix and provide their own opinions. And when customers are happy with your services, they are often more than willing to give positive feedback. Studies have shown that products and services coupled with a positive review sell 200 times better than products and services without reviews or ratings. Actively collecting reviews and ratings through customer review portals can have a lasting positive effect on a company's conversation rate and, consequently, its revenue. Many service providers lack a way to quickly and easily collect customer feedback. Actively managing customer reviews and ratings can amount to a lot of work, especially if you have to analyse individual hand-written surveys to figure out how satisfied your customers are. So, how can service providers quickly and easily collect the qualitative feedback they need? With ProvenExpert's industry-specific surveys and questionnaires, service providers have a number of quick and easy ways — both online and off — to send out customer survey invitations. The questionnaires offer up to 60 survey sub-criteria to choose from, but can also be filtered according to categories such as service, performance, cost-performance ratio, and more. Reviewers can also provide their own feedback text to help clarify the ratings they've given. ProvenExpert now offers survey templates for more than 40 industries, including architecture, car sales, coaching, construction, events, financial services, photography, gastronomy, hotels, IT services, real estate, legal services, accounting, insurance, and more. Service providers simply need to select the survey for their industry to start collecting concrete feedback and assessing the quality of their services. Plenty of customers today use popular search engines — first and foremost Google — to find the right service provider. Searching for local service providers on Google displays the top three Google My Business results for your area, including Google star ratings. These prominent listings draw more attention to local search results than to those in the standard search results list. The Google star ratings next to the listings show how satisfied customers are with each service provider. This gives consumers an idea of whether a given service provider is right for them, even before clicking on the results. With these five tips for local searches, we'll show you how service providers can include their businesses in local search results. Local search results are listed organically. Rating stars are important here, too, since they help to draw attention, and potential customers are much more likely to trust businesses with reviews and rating stars than those without. 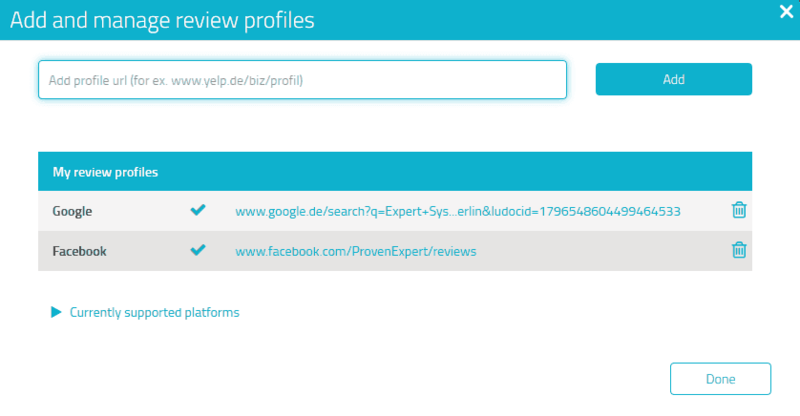 ProvenExpert lets you integrate your Google star rating into your website and ProvenExpert profile. By adding Rich Snippets, you can include your Google star rating in your organic search results listing and drive more traffic to your website. This, in turn, improves your ranking in the organic search results. You can read more about this in a fascinating guest entry in our blog. ProvenExpert supports a growing number of customer review websites from which you can aggregate reviews and ratings. Currently, we support more than 420 ratings websites and platforms, and we're getting bigger all the time. If you can't find a specific customer review platform in our current lineup, just send us an email. Our support team will handle your request and get the missing platform up and running for you. 5. How can I import reviews from other websites? Aggregating ratings from other customer review platforms allows you to display the entirety of your customer feedback in a single profile. There's no need to manually browse every website looking for new ratings. ProvenExpert's aggregation feature lets you display the number of ratings you've received on external platforms in your profile, as well as your overall score. First, sign in to your ProvenExpert account (Not a member yet? Click here to sign up). Scroll down below your ProvenExpert ratings to the "Reviews from Other Sources" area. Click on the blue arrow to the right to open the drop down menu. Then click on the button labelled "Add Profile". Click first on the blue button labeled “Add profile” to add your reviews and ratings from external customer review platforms. A layer will open where you can insert the URL of the customer review platform you want to collect ratings from. Insert the customer review platform's URL here. You can add up to as many customer review platforms as you like. This example contains reviews from bewertet.de, kennstdueinen.de and facebook.com. Now click on “Add”. Depending on which plan you have chosen, ProvenExpert lets you aggregate reviews from up to 250 different customer review platforms. After adding a platform, the information you provided will be checked by our team. You'll receive an email as soon as the platform and its reviews have been integrated. We will contact you per email and external ratings sources and ratings will be aggregated on your profile after the ProvenExpert team conducts its check. Click the “Manage Reviews” button to edit or delete your aggregated review profiles, as well as add additional platforms. The ratings added from websites using the aggregation feature, are automatically kept up to date on a regular basis and are always visible in your profile. We also send out weekly reports to inform you of all new incoming ratings from external platforms. It's up to you whether you want to include any new incoming feedback in your profile or simply use it for internal analytics purposes. Choosing to publish incoming feedback will incorporate the ratings into your Google star rating. In order to maintain our own standards of quality, we review each and every external customer review source to verify the authenticity of its ratings. ProvenExpert requires that all incoming ratings meet its verification standards, and that all customer feedback corresponds to products and services that you actually offer. With our aggregation function, both you and your potential customers can see all your ratings at a glance. Want to use ProvenExpert for your business? Are you a service provider? Looking for the right service to manage your review marketing program? Try ProvenExpert PREMIUM for free for 30 days. Following your free trial, you'll be automatically switched over to our FREE plan. Is it difficult to collect customer feedback? No. With ProvenExpert, you can create your very first survey in just three minutes. Our wide selection of industry-specific questionnaires lets you choose which aspects of your service to target in your survey. Is analysing customer reviews expensive? No. With ProvenExpert, you can create surveys, conduct analysis, and display the results completely free of charge. Can customer surveys improve my Google search listing? Yes. Your reviews can be displayed as a Google star rating to draw more attention to your website, lend your business more authenticity, and generate trust in potential customers. What about my reviews and ratings on other websites? ProvenExpert can aggregate all your reviews and ratings from other platforms and display your overall rating in a single profile. Depending on your plan, you can integrate up to 250 customer review websites.